Mom and dad on their wedding day. Don't you love the dinner jacket my dad is wearing? For my parent's 50th anniversary (happy anniversary mom and dad) we wanted to come up with an original gift to give them that helps them remember their day. 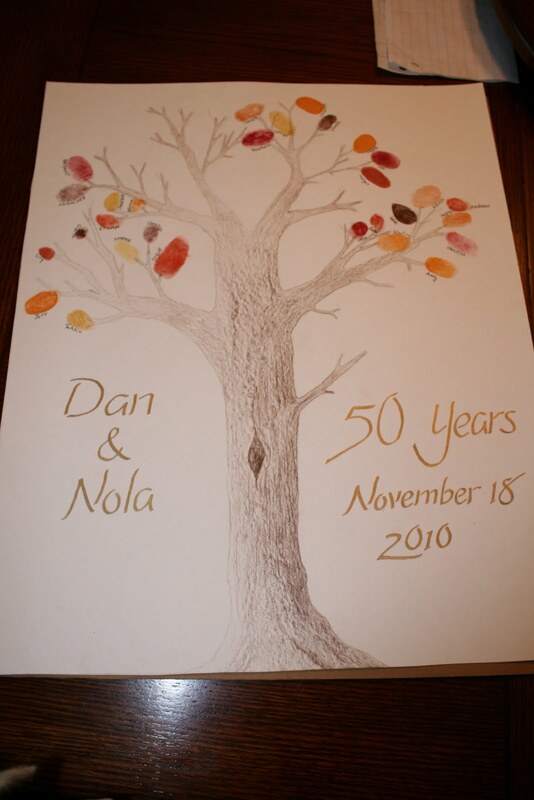 I was reminded of a very cool wedding that I went to that had a Thumbprint Tree as a guest book. The bride and groom had everyone "stamp" their tree with their thumbprint and write their name under it. Then they framed their tree and hung it in their new home. I thought that would be a perfect memento for mom and dad. Fortunately, my sister's kids are very talented artists so her son Carson drew this tree. We chose to use autumn colors for the stamps because my parents were married in November. I thought it turned out great and now they have it framed in their home. How cute would this be for a baby shower, a baptism, birthday, wedding retirement or milestone birthday. If you don't have a talented nephew you can order it on Etsy. 2 Response to "Thumbprint Tree"
What a neat idea! I've never seen that before. Just heard about your blog from Debbie the other night and she ranted and raved about your chicken enchilada soup. It looks delish. Can't wait to try it. Everything looks so beautifully put together and yummy. You are so talented! Sadie thanks for the compliment. You are awesome!